Don't know what to do with your lightly used, well-loved gear? 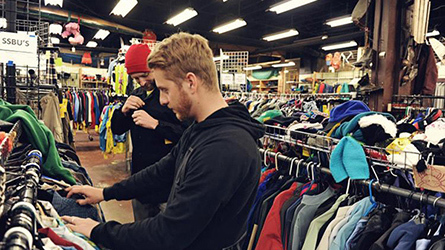 Next Adventure can offer you store credit for your quality used outdoor equipment. We are always looking for quality technical gear that is clean and functional. Come check out the Bargain Basement here at Next Adventure! We've built a reputation on selling high quality used gear at great prices and our bargain basement doesn't disappoint! We have everything you need for your outdoor adventures including apparel for the whole family and all sorts of gear for all seasons of the year! We don't list used gear on our website but never fear because we keep the store fully stocked! Swing in today! Everything must be clean and complete with insoles and laces. Most shapes & sizes of tents and backpacks are welcome. Tents must be clean and functional. All zippers must be working. All apparel must be clean and fully functional. That means no holes, rips, tears or other flaws with the clothes. Carhartts are encouraged. Must be clean, fully functional, and free of holes. This category covers everything from paddles & dry tops to wet suits & dry bags. No rear entry boots and all downhill skis must be shaped. No straight skis. XC skis must have a currently manufactured binding system. Downhill skis must be free of major damage and have a current manufacturer indemnified binding. No step-in bindings or boots. Boards must be in relatively good condition, and are free of major damage. Boots must have laces and insoles. We only buy shoes, chalk bags, crash pads, axes, and other non safety rated equipment. Most disc golf gear is accepted with the exception of really warped or damaged discs. Bike shoes must have a current interface. We will not buy bike components of any kind. We selectively buy and sell some team sports items.